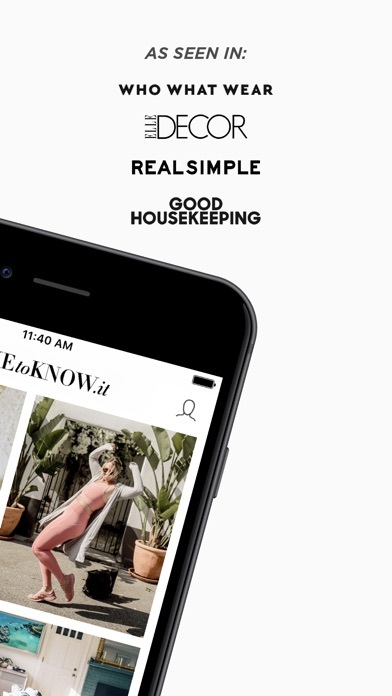 Search and discover millions of real products styled by, on, and for real people on the LIKEtoKNOW.it app. All you find is 100% shoppable, so you can instantly shop whatever catches your eye. 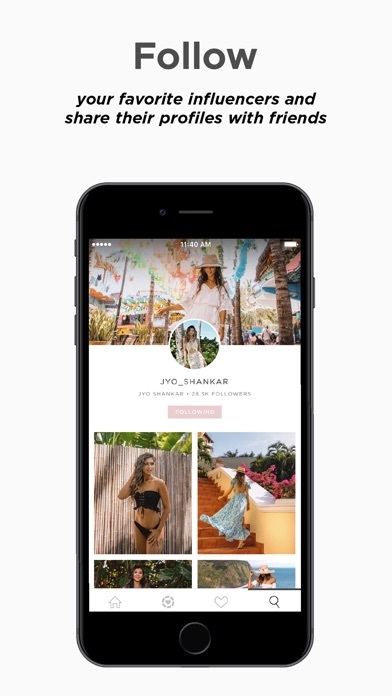 HOW IT WORKS Download the LIKEtoKNOW.it app and create your profile to instantly access real, shoppable content from bloggers, influencers, and celebrities who are in the LIKEtoKNOW.it community. 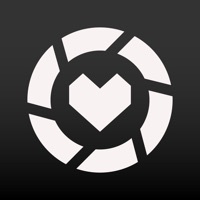 Find and follow your favorite influencers so you never miss their posts or search for something specific to see it styled in all different ways on all different people. Search sweater dresses, over-the-knee boots, strollers — whatever it is you’re really looking for, you’ll get real answers from real people here. 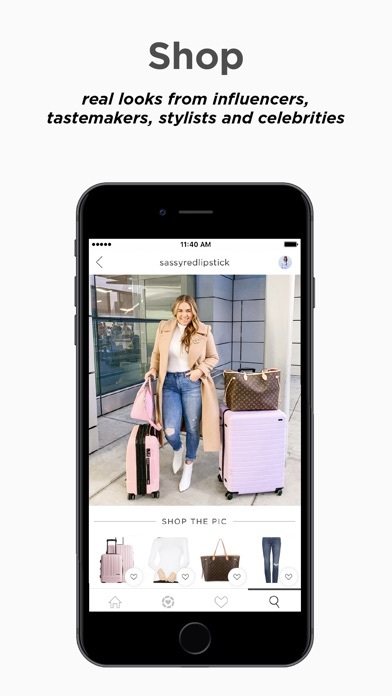 SEARCH Find what product you’re in search of via thousands of instantly shoppable and stylized results. 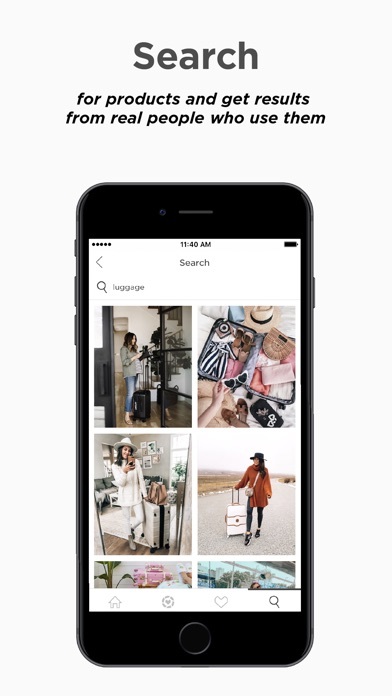 FOLLOW Create your perfect, shoppable feed by finding and following your favorite influencers. SAVE Save items that catch your eye to your Wish List, then organize them into Collection folders to easily browse later. SCREENSHOT Across social media, screenshot LIKEtoKNOW.it-enabled pictures to get instant details in the app. Great app but they send waaaaaay too many emails. Great way to find out what’s hot right now without the negative feedback. I love this App for seeing what other influencers are wearing and exactly where I can get it. So appreciative there is something like this. It takes so much time to find the items on my own. Saves me so much! Best app ever for shopping!!! I love how easy it is to use and find fashion bloggers. Also the automatic link to the clothing or product is so convenient! This app makes shopping so much easier! Also.... it makes it so much easier and oops, maybe I have more clothes now! This app has completely changed my wardrobe for the better! I’ve found so many amazing fashion bloggers (my fav is livingmybeststyle) that share such cute and affordable clothes. I’m so bad at putting outfits together so my wardrobe was a bit of a jumbled mess before. Now I just basically copy the looks that my favorite bloggers share and now I always look so trendy while comfy at the same time! 100% recommend for online shopping lovers!! I really love that I can click on a photo and see where I can find each item. It helps me see what outfits will really look like on. Not just on a mannequin or on a model. I will say that I don’t like that some people don’t actually tag what they are wearing but instead something similar that is way more expensive. I also don’t understand why some “Influensters” are taking photos of multiple outfits in the dressing room of the store rather than what they have actually bought. Thanks! I use to use Polyvore (no longer exists) but they had a similar search functionality that this app was missing until now! Love it!!! As a mom of 3 I love this idea of shopping, but also as a mom of 3 I wish this app could alert me to when my faves go on sale. While many clothes were cute and fashionable, not appropriate for professional wear. Would like more fashionable, but not flashy, outfits especially for women over 40. Most “models” are young and quite thin. More variety needed. This app is all around great! Makes shopping for my college student SO much easier!!! I can’t believe this has been around for years. It’s great! The 1 thing that could be better is always showing exactly where the item listed can be purchased instead of giving an alternative. I don’t want the alternative unless the pictured item is sold out or no longer for sale. And if that’s the case say that. The whole point of the App is to find out where you can get an item you see. Great app such great ideas and easy way to shop. I don’t love shopping but this makes it so much easier to find looks that I love and almost feels like I have a personal stylist at my fingertips! Would be great if we could shop the closets of the influencers as well. I assume they have a ton of gently worn/worn once items they would like to sell to users! Love this app!! Easy to use. I can’t even find the app on my phone. I downloaded it created an acct and now I have to go though the app store to open it??? I love the app but Id like to open it as AN APP. I love following different people to find cute house decor but especially new outfits or pieces I otherwise would never have found!! Great bloggers to choose from too!! Mostly love this. Got in once and it had automatically followed all these other people as “suggestions.” I was not a fan - I follow certain people for certain looks and don’t need/want suggestions. I love this app!!! Have found so many things I need very easily!! The only thing I’d like the app to have is the abilit to organize my selected things into brands (creating folders or something), cause it’s difficult having all mixed up. I love to be able to find an outfit I like and have every item linked with alternate options. I really find the platform great however I wish there was a desktop version of this app or a way on the website to see the items you save and not just shop your screenshots. I still prefer to shop via my laptop. 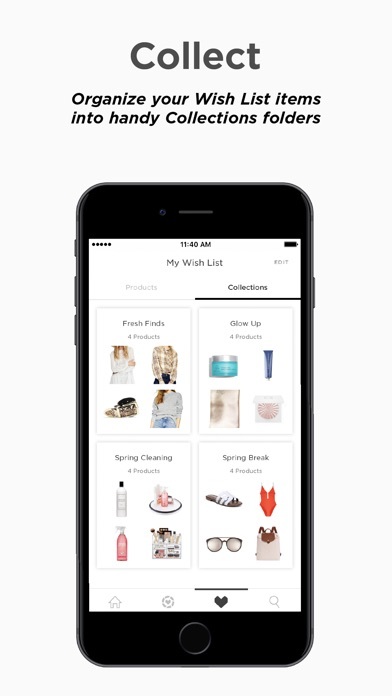 It makes finding items a breeze and if you aren’t ready to make the decision you can put it on your wish list. I highly recommend this app to anyone who’s on social media and even if your not it a great resource. I love the concept of this app but I’m constantly having trouble seeing things I screen shot from Instagram. It’s so frustrating. It was so much more convenient to “like” a photo via Instagram than taking a snapshot. Please bring back the “like” feature! Excited to share my looks and get inspired by others!! Thanks LTK fam!! This app is AMAZING!! It’s so helpful and it has helped me redo my closet completely!! Such an essential to my everyday life! Love love love this app! It has changed my closet completely! Disruptive to go in and out of the Instagram experience. Chopping experience. 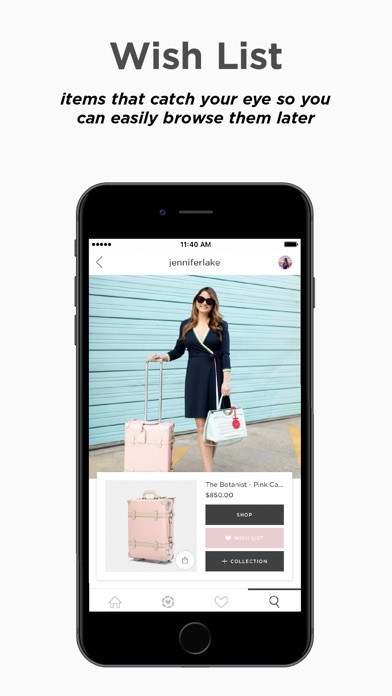 This app is an awesome way to easily shop your favorite Instagram influencers. It’s absolutely turned me into a major impulse buyer! But I hate that I have to screenshot the posts I’m interested in. I liked it much better when all you had to do was like the photo. It’s also glitchy - half the time my screenshots never show up in the app. That said, it’s definitely a fun way to shop. A resourceful app to inspire my shopping addiction! Have gotten so many great ideas! I’m living for this app! The only thing that this app is missing is a way to alert you when something you like goes on discount. I know there are other apps for that but I dont like having too many apps it gets to be too much. Where has this app been? Omg i cant. Love it so much. I was someone who would see styles of such cute outfits, or home decor, and for awhile, I never knew where to look. But, thankfully, this app has helped guide me in the right direction. And I love it!